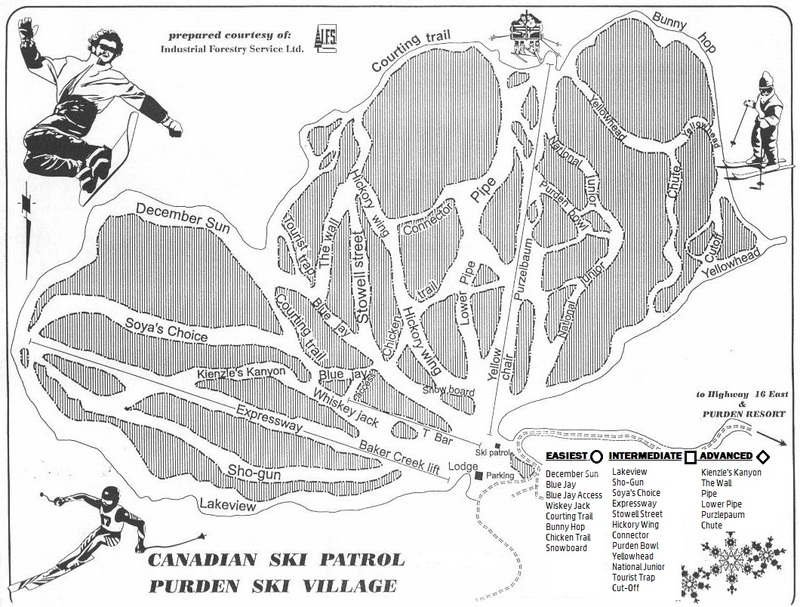 LIFTS: To get you up the mountain, with virtually no line-ups, Purden has 3 lifts: ● two chair lifts, ●one T-bar. DAY LODGE/CAFETERIA: For hungry skiers we have a large licensed day lodge/cafeteria with plenty of seating. The fireplace will warm you up on a cold day, while you enjoy either your brown bag lunch, or a double pattie cheeseburger with fries & gravy hot! from the kitchen.The south end of the lodge offers convenient spectator seating, with extra-large windows overlooking the slopes, for those that have to "call it a day" a little earlier than the rest. FIREPLACE: Do you welcome a few hours respite away from your desktop computer? Then curl up in front of the fireplace, and choose from a few novels or magazines to pass the time. Just don't let the fire go out! PLAY AREA: For big riders who have little ones not yet riding, a large play area will keep the young ones entertained while Mom and Dad shred it. Bring Grandma along to babysit. RENTALS: Our rental shop has an abundance of skis, snowboards, powder skis and helments for rent. The "shop" also sells gloves, touques and other necessities. LESSONS: Purden offers complete lesson packages for both skiing and snowboarding with certified instructors. GROUPS: Purden also offers special group rates and flexible programs for groups of 20 skiers/riders or more.